The Official XBOX Wireless Controller - Combat Tech Special Edition is increasingly becoming the golden standard for PC gaming. It’s proven to work better than most controllers in the market. Though the keyboard and mouse are still dominant, they lack the flexibility and choice of PC gamers need. The official Xbox wireless controller redeems this by offering great options for platformers, fighting, and racing games. Here is an in-depth analysis of its features and functioning. The Xbox wireless controller is the third debut in the combat tech series launched in 2017 by Microsoft. This gamepad lineup also features the Patrol Tech and the Recon Tech special edition. The recon tech was the first to be released followed by the Patrol tech and lastly the combat tech. Both the patrol and recon controllers also have a military-inspired aesthetics that caters to a selected group of Xbox gamers. All of these controllers are compatible with the Xbox one series. Featuring a sleek dark green military design with black silver and orange accents. The design is inspired by combat vehicle performance patterns and military technology. 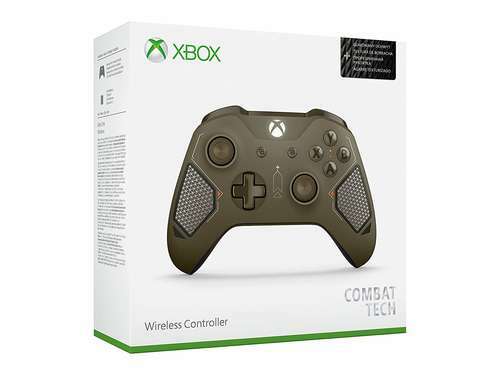 The new Xbox wireless combat tech edition is similar to it’s predecessor Patrol and Recon Tech controllers. It features a back rubberised diamond grip for enhanced comfort when gaming. The controller also comes with an etched laser grip in the front of the pad that further heightens the design. The combat tech features a Bluetooth technology play for gaming on windows 10 pcs and tablets. This technology also extends to the Samsung Gear VR. Other fan-favourite features of the combat tech edition include the 3.5 mm headphone jack and the custom button-mapping icon. Whether playing PUBG or Sea of Thieves, the controller offers you maximum control in your 4K gaming experience.